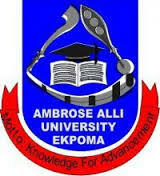 Ambrose Alli University, AAU Ekpoma Preparation For Second Semester Computer Based Examination (CBE) and Instructions to Students for 2017/2018 Academic Session. The Second Semester 2017/2018 CBE commenced on Monday, September 3, 2018. In order to avoid the various challenges faced by students during CBEs, it is important that the following information be brought to the notice of students. Plans have been made to ensure that the exact time and duration for each CBE be made known to students days before each examination. Every student MUST come to the CBE venue with an authentic printout of either the Venue Allocation Slip (VAS) or current school fees payment containing a clear picture of the candidate. Students are required to maintain an orderly queue in front of each venue to make checking easy for invigilators. Any electronic device (Phones, Smart Watches, Smart pens and USB devises, Smart goggles, etc) found with any CBE candidate in the queue will be confiscated and will not be returned to the candidate. Technical staff have been deployed in each of the CBE venue to assist candidates with technical issues, should they arise. If such issues, as in v above are beyond the mandate of the technical staff, they will direct the candidates to the complaints room for further action. Candidates whose computer malfunctions during examination MUST ensure that the problem is resolved DURING THE PERIOD OF THE EXAMINATION and not hours or days after the examination. Candidates having any CBE related challenge not addressed by v-vii above should seek audience with the CBE Committee Chairman or any CBE Committee member on duty in the complaints room inside HALL C.
The Mobile Students’ disciplinary Committee will always be on ground to try and act of unruly behavior, indiscipline, examination irregularity or breach of matriculation oath during examinations. The time allocated for each examination shall be strictly enforced by the CBE Committee. Late coming or refusal by students to come in to the examination venue will no longer be tolerated. WISH ALL CBE CANDIDATES GOOD SUCCESS IN THE FORTHCOMING EXAMINATION. Students who paid or logged in their School Fees on the day of their CBE shall no longer be able to access their CBE questions. This unpalatable step has become necessary due to the unnecessary delays in the commencements of CBEs occasioned by the regular updating of school fees database to enroll students who paid their fees minutes before their CBEs. With effect from second semester 2017/2018, enrolment of students shall be done the evening before any scheduled CBE. For the students who may miss their scheduled CBEs due to late payment of school fees, the University Senate has already taken a decision that such students can write the missed CBE at the next available opportunity as first attempt. Students are by this memo informed of this development in order not to be taken unaware.